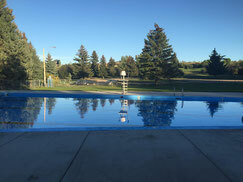 Come enjoy a refreshing dip in our heated outdoor pool! Parking abounds, change rooms are available, and there are registered lifeguards always on duty. The pool is conveniently located by the concession, and offers plenty of green space to catch some rays. If you're planning your summer vacation at Palliser, why not sign your children up for our Red Cross certified swimming lessons? Read on for more details! 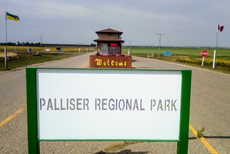 Like and Follow the Palliser Regional Park Pool Facebook page for lesson schedules and other up-to-the-minute announcements. When registering your child for lessons, please complete the following form and either email it to palliserparkpool (at) gmail.com or bring the completed form with payment to the pool office. The cut off time for swimming lesson registration is at 2:00 pm the Sunday before the lessons begin on Monday. You can pay by cash, cheque, or debit. Payment is due before your child can partake in lessons.